Relicanth in game: 2,586 Who? Important notice! Pokemon Relicanth is a fictional character of humans. 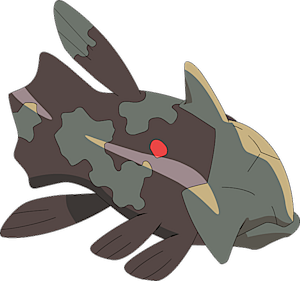 Relicanth is a Pokémon that is heavily based on the coelacanth. It is covered with hard, brown scales that are similar to craggy rocks. The composition of its scales allow it to withstand the intense pressure of the ocean depths. Its tan head has protruding cheekbones, which are smaller on a female. A triangular spike protrudes from the back of its head. Tan patches cover its body and there is a red spot located on both sides. It possesses two pairs of pectoral fins, which it uses to push itself along the sea bottom. 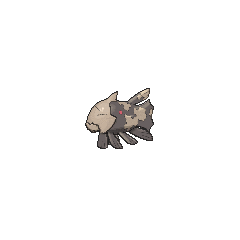 Additionally, it has dorsal and pelvic fins near its tail. Its tail fin has a wavy outline. Relicanth is a filter feeder, and it feeds on microscopic organisms with its toothless mouth. It has remained unchanged for 100 million years. 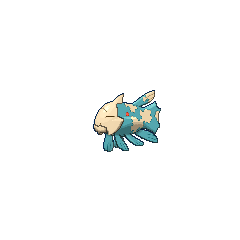 A group of Relicanth appeared in The Relicanth Really Can!. It was first shown in the episode A Ruin With a View!. A Relicanth appeared in the opening of Lucario and the Mystery of Mew. 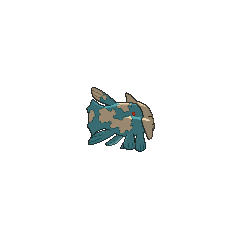 Multiple Relicanth also appeared in Pokémon Ranger and the Temple of the Sea. A Relicanth appeared at the beginning of Zoroark: Master of Illusions. Multiple Relicanth appeared in Going for the Gold!. A Relicanth appeared in a fantasy in SM005. In Pokémon Adventures, Sapphire has a Relicanth nicknamed Relly. It was one of the keys to solving the mystery of the Sealed Chamber. 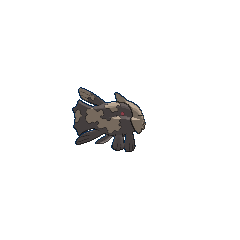 While he still belongs to Sapphire, it was not seen in her party during the Emerald chapter and is assumed to be at sea with her Wailord, Lorry, as of Sapphire's latest appearance. Relicanth is a combination of relic (something old that has survived the passage of time) and coelacanth. 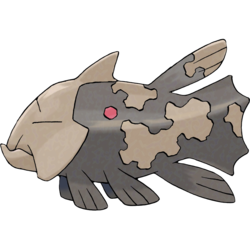 Glanth is a combination of 爺 jī (old man) and coelacanth.